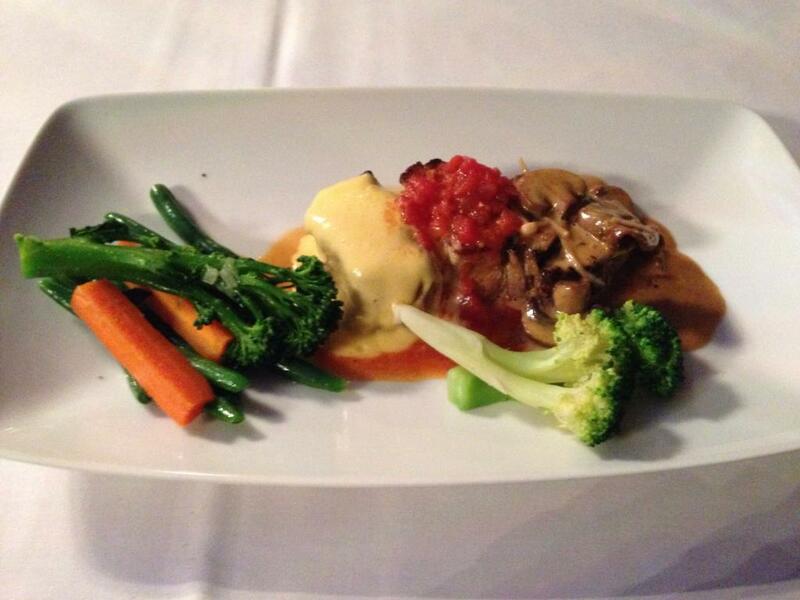 Grilled beef, veal and pork fillets served with tomato, mushroom and hollandaise sauce. The first fillet, beef, is fairly soft, but has a kind of "chop" texture to it. I'm chewing on little well-cooked bits for a while after I've finished eating it. The texture is also fairly inconsistent. It's well done on the outside, but almost gelatinous in the inside. This would be fine for home cooking, but isn't fancy cuisine. The runny sauce just has a simple cheese flavour. The second piece—the pork—is similar in that it lacks a strong taste, and is just meat. It's tomato topping is simple and nondescript, and the whole thing could use some salt. The beef is last. Its mushroom sauce is slightly tastier than the the others, but it's just a slightly bitter mushroom taste. At least this fillet doesn't have any bits that linger in my mouth. I think the downside of having a dish with three different meats is that not much effort goes into each one. 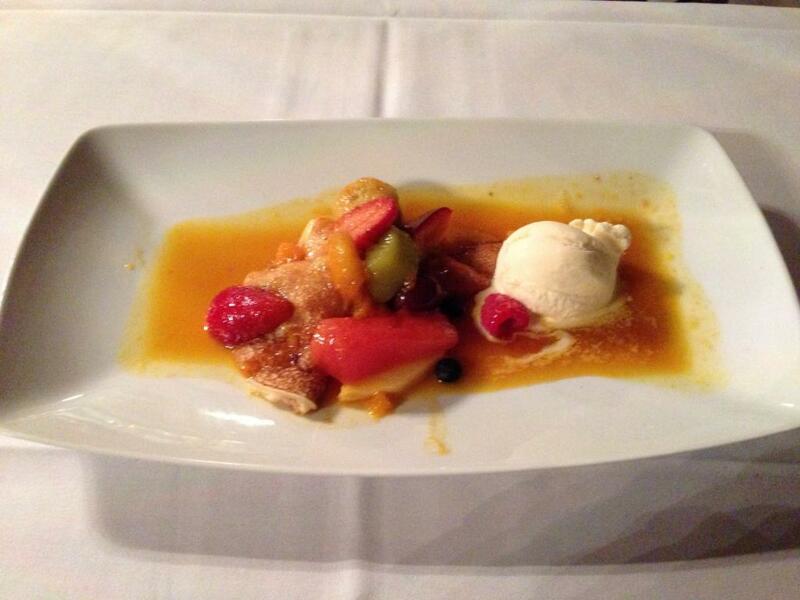 A fine pancake with lots of fresh hot fruit in an orange and liqueur sauce. The pancake here is surprisingly bland. It's just a regular pancake. Combining it with ice cream doesn't really add anything. It just tones down the ice cream, which is unnecessary. I generally expect a pancake to be a base for something very sweet. The fruits here are pleasant enough, but warmed up tropical fruits are a bit strange. Warm, flaccid watermelon is as appetising as you'd expect. Warm grape isn't too much better. The sauce in the plate isn't really sweet, and has a mild orange taste. It obviously does nothing to assist the bland pancake.